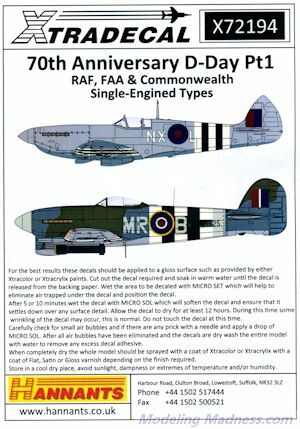 A great new sheet from Xtradecal is this one celebrating the 70th anniversary of D-day. 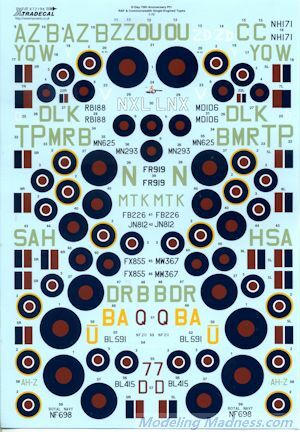 This one concentrates on RAF, FAA, and Commonwealth squadrons (which means mostly green/grey over grey planes), all of which have invasion stripes. These are all single engine aircraft, which is one reason there are so many options. In fact, it is easier for me to provide a link to Hannants so you can see them all. We are provided unique markings and insignia for 16 different aircraft. These are Spitfires, Mustangs, Typhoons, Tempests, Hurricanes and a Swordfish. Supermarine Spitfire LF Mk.Vb BL415 AZ-B 234(Madras Presidency) Sqn Flt.Lt Walt 'Johnnie' Johnston RAF Deanland;Spitfire Mk.Vb BL591 BA-U A Flt 277 Air Sea Rescue Sqn RAF Shoreham. My thanks to Hannants for the review sheet. You can get yours at this link.